When Do The Chocolate Lilies Bloom? Where Do I Go To See The Chocolate Lilies Blooming? When Do The Chocolate Lilies Bloom? Where Do I Go To See The Chocolate Lilies Blooming? The most frequent question we get at the Santa Rosa Plateau about plants is: When do the chocolate lilies bloom?, followed in popularity by Where do I go to see the chocolate lilies blooming?. This page answers those two questions. Our species of chocolate lily is Fritillaria biflora var. biflora. Chocolate lilies have bloomed as early as February and March, and as late as April and May. Hence if you visit the Reserve on April 1, you may have completely missed the show, in the first case, or will be too early, in the second case. Thus the only way to catch them for sure is to start checking in early March, or call the Visitor Center for the latest information. Detailed records of bloom times are given below. Munz (1974) gives a bloom time of Feb-June, which agrees well with the observations here. Remember, the bloom time in such floras as Munz give the full range in which specimens have been collected with blooms, not the actual bloom time in a given year, which is much shorter. Most species, including chocolate lilies, are in full bloom for a period of about three weeks, with the specific period varying by year. For a discussion of some of the factors which cause the bloom to change its start date, see Analysis of Plants Blooming on the Vernal Pool Trail Vs. Time in 2003. Chocolate lilies bloom well in most years; only severe drought years like 2001-2002 have produced pathetic blooms. 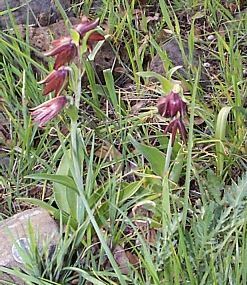 Chocolate lilies are found only on the grassy slopes below the lips of the Mesas, in heavy clay soils. The newly-routed (in 2004) Vernal Pool Trail has the most chocolate lilies of any trail. They are found in a number of patches in its lower section, beginning just below the chaparral area at mile 1.37 from the trailhead. There are about 50 plants in about ten locations that can be photographed without leaving the trail, with a total of over 200 plants visible from the trail. Second in abundance is the S. Trans Preserve Trail. 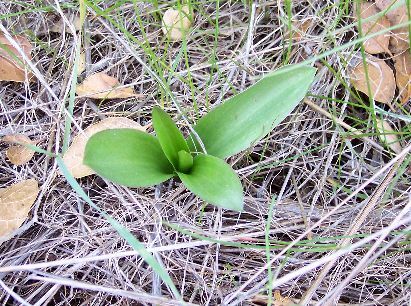 Although there are only about five plants in two locations along the trail, there are again about 200 plants visible from the trail. 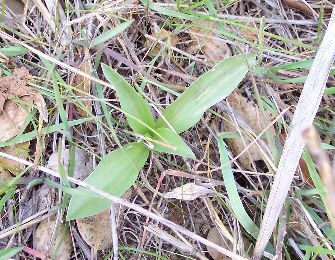 Please do not go off-trail to photograph these plants; visitors regularly trample chocolate lilies that have not yet bloomed when they do so! 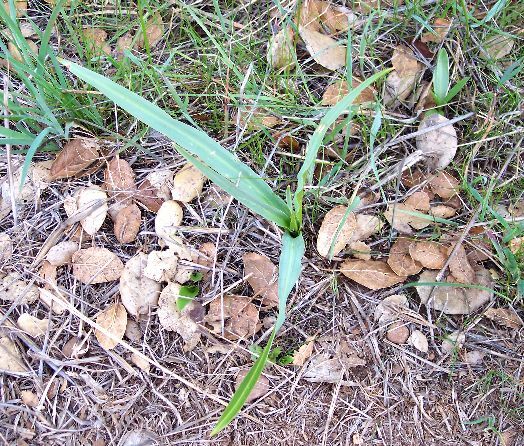 Some chocolate lilies grow immediately alongside the trail, and we have had people run over them with stroller wheels and trample them with their boots. Third in abundance is the S. Los Santos Trail. It also has only about five plants in two locations along the trail, with perhaps a few dozen more visible off-trail. The plants on the above three trails, all on the north-facing slopes of the Mesa de Colorado, tend to bloom at the same time, and tend to bloom later than the fourth location, which is visible from Waterline Road, just east of its intersection with Fault Road, on the flattish west-facing slope below the Mesa de Burro. In several years, the plants bloomed first on Waterline Road, and began to bloom on the other trails only when the plants on Waterline Road had finished blooming. There are about 200 plants, all off-trail, but easily seen from Waterline Road when they are in bloom. Again, please do not go off-trail to photograph these plants. 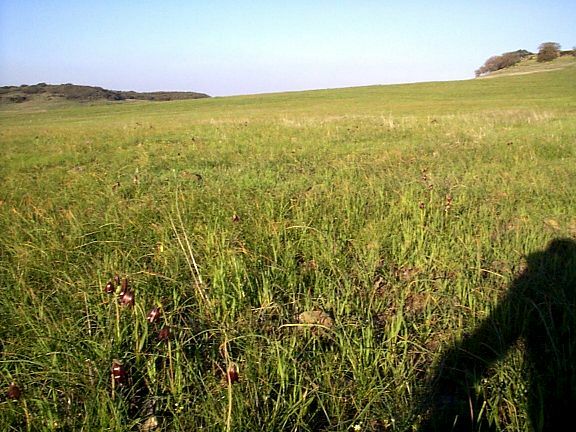 Believe it or not, many times docents at the Santa Rosa Plateau have directed people to the exact locations of chocolate lilies in bloom, but the visitors come back and report that they couldn't find any. Chocolate lilies are hard to see if you have never seen one before, due to their, well, chocolate color, which does not stand out like a white or yellow flower would. Compare the following two photographs. The photograph on the left is similar to what you would see with your eye from Waterline Road. There are at least 50 blooms, and probably over 100, present in the picture. But if you happened to miss noticing the closest blooms in the picture, I suspect you would never notice the farther blooms. The scale is given by my shadow; I'm standing on Waterline Road. The Mesa de Burro is at the right top of the picture; No-Name Mesa is at the left top. The photograph on the right is what you typically see in close-up photographs of individual plants. Note how much harder it is to see the plants in the field! If you weren't paying attention, you'd hike right by hundreds of open blooms, and see nary a one. I've talked to many people who have reported not seeing any, despite there being hundreds to see. 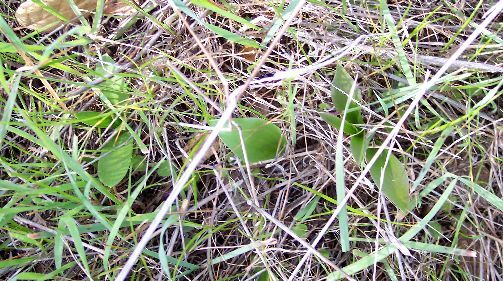 Thus if this is the first time you go out looking for chocolate lilies, take along someone who has seen them before so they can point them out to you. Lacking that, ask other visitors on the same trails if they have seen them. Finally, the sure way, unfortunately, to locate plants in bloom or that have bloomed, is to look for trampled areas alongside the trail. 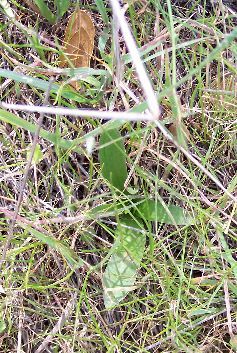 Photographers often lay down alongside the plants to photograph them, resulting in lots of smushed grasses, as well as chocolate lily buds. It shouldn't need saying, but does: Do not pick any flowers at the Santa Rosa Plateau! Believe it or not, we have had church groups caught picking chocolate lilies and other flowers on our trails! Picking flowers immediately destroys the experience for other visitors, since those flowers will no longer be there for the hundreds to thousands of other visitors that may go by that location in the next day or two. Take only photographs, and leave no footprints off trail. We do patrol the trails frequently when the chocolate lilies are in bloom, and we usually have docents at the trailheads. Our visitors are very good about alerting docents when someone is seen to be picking flowers, and our docents will immediately pursue you. You will be cited by the Ranger if you are caught picking flowers, and, of course, the flowers will be confiscated. I kept detailed records for the year 2001 for the entire Santa Rosa Plateau, and for the year 2003 just for the Vernal Pool Trail. The following table gives the start and end of blooming, as well as the start and end of peak bloom. Peak Bloom is defined as when the maximum number of flowers were open in a given year. The beginning and end times below are when 1% of the maximum number of flowers were open. Typically, the very first flower and the very last flower appears only a week before or after the 1% dates. At peak bloom in a normal year on the Vernal Pool Trail, there are about 200 flowers open; 1% of that number is 2 flowers open. Note that peak bloom lasted for 23 days in 2001, and an amazing 42 days in 2003. Three weeks is probably a typical peak bloom period; 2003 may have been exceptional since it followed the severe-drought year of 2001-2002. Less detailed information is available from the following years. The 1996 and 1997 data come from the records of Gordon House. These pictures were taken on 26 February 2006. The plants weren't seen three days earlier, so probably were only a few days to a week old when the pictures were taken. The scale is given by the coast live oak, Quercus agrifolia, leaves on the ground, whose blades are typically 3-4 cm (1.2-1.6 inches) long. Sometimes a baby soap plant, Chlorogalum pomeridianum, is mistaken for a baby chocolate lily, but once you've seen both, they are unmistakably different. The bottommost picture below shows a baby soap plant in the middle, with baby chocolate lilies on either side. Copyright © 2006 by Tom Chester.